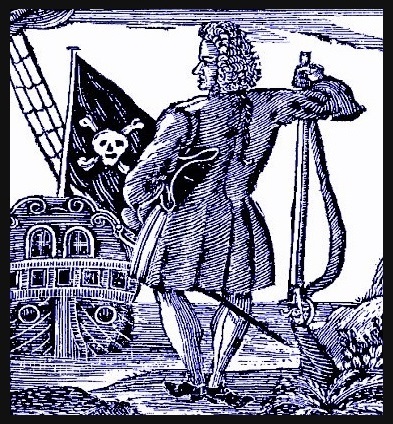 Born in 1688, into a wealthy English family, Stede Bonnet was sometimes called "The Gentleman Pirate". After his father's death in 1694, he inherited his family's large sugar plantation, southeast of Bridgetown on the island of Barbados. On Nov 21, 1709 he married Mary Allamby in Bridgetown. They were to have three sons and a daughter. Bonnet held the rank of major in the Barbados militia. Information regarding his military knowledge or duties are vague. His rank was probably due to his land ownership. In the spring of 1717, Bonnet decided to abandoned his comfortable life and family for a career as a pirate. This was unheard of for someone of his status, and even more unusual for a man having no knowledge of shipboard life. In the book 'A General History of the Pyrates', Charles Johnson wrote that Bonnet was driven to piracy by his wife's nagging and the "discomforts he found in a married State". His decision would scandalized the polite society of Barbados, and Bonnet's acquaintances thought him emotionally disturbed for it. Bonnet contracted a local shipyard to build he's pirate ship, a sixty-ton sloop, which he equipped with six guns and named the Revenge. This was also very uncommon, as most pirates would steal their ship by force, or else converted a privateer vessel to a pirate ship. He recruited about 70 men for his crew, and in another odd break from tradition, Bonnet would pay his crew wages, not shares of plunder as was the common pirate practice. This payment of wages helped Bonnet retain command over his men, who otherwise may have voted him out as captain for his lack of experence. He relied greatly on the skills of his quartermaster and officers for their knowledge of sailing, and as a result, was not very well respected by his crew. After a few days of preparations, Bonnet cast off one night without a word to his friends or family. He sailed to the coast of Virginia near the entrance of the Chesapeake Bay, where he captured and plundered four vessels. The last ship, a Barbadian known as the Turbes, was burned to keep news of his piracy from reaching his home island. Bonnet continued to sail north to New York, capturing two more ships, and releasing captives at Gardiners Island. By August 1717, Bonnet had sailed back south to the Carolinas. There he attacked two more ships, a brigantine from Boston and a Barbadian sloop. In September 1717, Bonnet decided to sail for Nassau, which was at the time an infamous pirate den on the island of New Providence in the Bahamas. While sailing for Nassau, his sloop encountered, fought, and escaped from, a Spanish man of war. The Revenge was badly damaged, and Bonnet was seriously wounded. About half of his crew were wounded or killed in the fight. Putting in at Nassau, Bonnet replaced his casualties, repaired and refitted the Revenge, increasing the sloop's armament to twelve guns. While on the island, Bonnet meets pirates Captain Benjamin Hornigold and Edward Teach(Blackbeard) for the first time. Disabled by his wounds, Bonnet temporarily ceded command of the Revenge to Blackbeard, but remained aboard as a guest of the more experienced pirate captain. They sailed northward to Delaware Bay, where they plundered eleven ships. In September 1717, they captured the sloop Betty, and went on later to plunder the Spofford and Sea Nymph, which were leaving Philadelphia. Late in October, the Revenge captured the Robert and Good Intent, robbing them of their supplies. Blackbeard, Hornigold, and Bonnet returned to the Caribbean in November, where on the 17th, they captured the 200-ton ship Concorde. After a falling out, plunder was divided and Hornigold sailed off in his ship Ranger. Blackbeard took the Concorde as his own and sailed south into the Grenadines, where he armed her with 40 cannon and renamed her the Queen Anne's Revenge. Bonnet and Blackbeard separated at about that time. In March 1718, Bonnet encountered the large 400-ton merchant vessel Protestant Caesar off Honduras. This ship however escaped him, and which frustrated his crew. When Bonnet encountered Blackbeard again shortly afterward, Bonnet's crew deserted him to join Blackbeard. Blackbeard placed one of his men named Richards in command of the Revenge. Bonnet, surprised by this act of betrayal, found himself as Blackbeard's guest aboard the Queen Anne's Revenge. Under Captain Richards, the Revenge captured a Jamaican sloop, captained by David Herriot, called the Adventure. Captain Herriot was persuaded to join the pirates, and Blackbeard now possessed three ships. Bonnet accompanied Blackbeard to South Carolina, where in the late spring of 1718, Blackbeard blockaded the port of Charleston demanding supplies. Afterward, Blackbeard and Bonnet headed north to Topsail Inlet, to rest and refit their vessels. While sailing the shallow waters of the inlet, the Queen Anne's Revenge ran aground and was lost. Some speculate that Blackbeard intentional grounded her. Blackbeard and Bonnet went ashore and journeyed to Bath, which was then the capital of North Carolina. Both men accepted pardons from Governor Charles Eden under King George's Act of Grace, putatively on condition of their renouncing piracy. 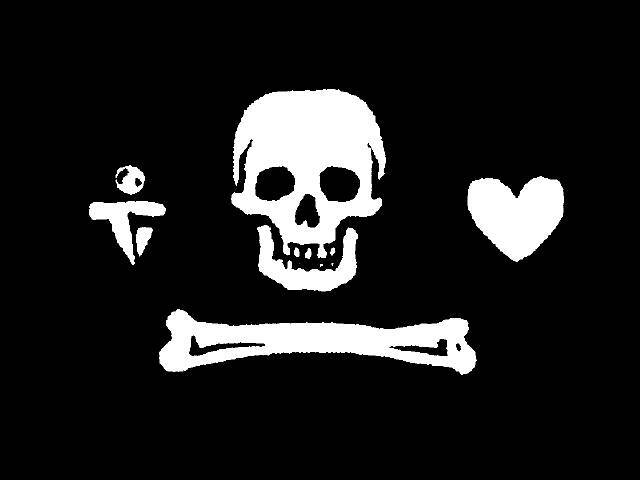 While Blackbeard quietly returned to Topsail Inlet, Bonnet stayed in Bath to get a "clearance" to take the Revenge to Denmark's Caribbean colony of St. Thomas, where he planned to buy a letter of marque and go privateering against Spanish shipping. Eden granted Bonnet this clearance. Upon his return to Topsail Inlet, Bonnet found that Blackbeard had beached the majority of their former crew on a sandbar, robbed the Revenge and two other vessels of most of their supplies, and sailed away for parts unknown aboard the sloop Adventure, carrying all the pirate loot with him. Bonnet now took back command of the Revenge. Adding much needed manpower, he rescued a number of the men whom Blackbeard had marooned. Not long after, Bonnet received word that Blackbeard was moored at Ocracoke Inlet. Bonnet set sail at once to find him, but he never did. Bonnet apparently still had hopes of reaching St. Thomas and getting his letter of marque, but two problems now tempted him back into piracy. First, Blackbeard had stolen the food and supplies they needed to stay at sea. Second, St. Thomas was now in the midst of the Atlantic hurricane season, which would last until autumn. However, returning to piracy meant nullifying the King's pardon. Hoping to preserve his pardon, Bonnet adopted the alias "Captain Thomas" and changed the Revenge's name to the Royal James. Bonnet further tried to disguise his return to piracy by engaging in a pretense of trade with the next two vessels he robbed. Soon afterward, Bonnet decided to abandon the ruse and reverted back to his pirate ways. In July 1718, he sailed north to Delaware Bay, plundering another eleven vessels. He retained control of the last two ships he captured; the sloops Francis and Fortune. At the start August 1718, the Royal James and the two captured sloops sailed southward from Delaware Bay. Bonnet and his crew then divided their loot into shares of about �10 or �11 and distributed them amongst themselves. This is the only time Bonnet is known to have practiced this important pirate custom, and it suggests he had by then abandoned his unusual practice of paying regular wages to his crew. Twelve days out of Delaware Bay, Bonnet entered the estuary of the Cape Fear River and anchored near the mouth of a small waterway now known as Bonnet's Creek. The Royal James had begun to leak badly and was in need of careening and repairs. Bonnet remained there for the next 45 days as work was done on the ship. According to Bonnet's boatswain, Ignatius Pell, the pirates intended to wait out the hurricane season there. News had reached Charleston at end of August, that Bonnet's vessels were moored in the Cape Fear River. Robert Johnson, governor of South Carolina, authorised Colonel William Rhett to lead a naval expedition against the pirates, even though the Cape Fear River was in North Carolina's jurisdiction. On September 26, Rhett arrived at the mouth of the Cape Fear River with two eight gun sloops, and a force of about 130 militia men. Bonnet mistook Rhett's squadron for merchantmen and sent three canoes to capture them. Unfortunately for Rhett, his flagship Henry had run aground in the river mouth, enabling Bonnet's canoe crews to approach. Recognising the heavily armed and manned sloops as hostile, the canoes return uninjured to warn Bonnet. The sun had set by the time the rising tide lifted the Henry off the river bottom. About forty six pirates were scattered among the three pirate sloops. During the night, Bonnet brought all of them aboard the Royal James and planned to fight his way out to sea in the morning rather than risk the Cape Fear River's narrow channels in the dark. At daybreak Bonnet set sail toward Rhett's force, and all three sloops opened fire, initiating the Battle of Cape Fear River. The two South Carolinian sloops split up in an effort to bracket the Royal James. Bonnet tried to avoid the trap by steering the Royal James close to the river's western shore, but ran aground in the process. Rhett's closing sloops also ran aground, leaving only the Henry in range of the Royal James. The battle remained a stalemate for the next five or six hours, with all the participants immobilised. Then the rising tide lifted Rhett's sloops free while temporarily leaving the Royal James stranded. Bonnet was left helpless, watching while the enemy vessels repaired their rigging and closed to board his paralysed vessel. Outnumbered almost three to one, Bonnet's men would have had little hope of winning a boarding action. Bonnet ordered his gunner, George Ross, to blow up the Royal James's powder magazine. Ross apparently attempted this, but was overruled by the remainder of the crew, who surrendered. Rhett arrested the pirates and returned to Charleston with his prisoners on October 3rd. In Charleston, Bonnet was separated from the bulk of his crew and held for three weeks in the provost marshal's house along with his boatswain, Ignatius Pell, and his sailing master, David Herriott. On October 24, Bonnet and Herriott escaped, probably by colluding with local merchant Richard Tookerman. Governor Johnson at once placed a �700 bounty on Bonnet's head and dispatched search teams to track him down. A posse discovered the pair and opened fire, killing Herriott. Bonnet surrendered and was quickly returned to Charleston. While awaiting trial, some sort of civil uprising in his support took place within the city, an event authorities would later describe as having nearly resulted in the burning of the town and the overthrow of the government. On November 10, Bonnet was brought to trial before Sir Nicholas Trott, sitting in his capacity as Vice-Admiralty judge. Trott had already sat in judgment on Bonnet's crew and sentenced most of them to hang. Bonnet was formally charged with only two acts of piracy, against the Francis and the Fortune, whose commanders were on hand to testify against Bonnet in person. Ignatius Pell had turned King's evidence in the trial of Bonnet's crew and now testified, somewhat reluctantly, against Bonnet himself. He was shortly found guilty and sentenced to death. While awaiting his execution, Bonnet wrote to Governor Johnson, begging for clemency and promising to have his own arms and legs cut off as assurance that he would never again commit piracy. Charles Johnson wrote in his book that Bonnet's visibly disintegrating mind moved many Carolinians to pity, particularly the female population, and London papers later reported that the governor delayed his execution seven times. Bonnet was eventually hanged at White Point Garden, in Charleston, on December 10, 1718. His body was left hanging for four days as a warning to others.